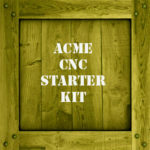 Let’s face it–there’s a lot to learn as you’re starting out in CNC. 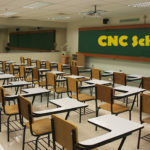 And, given that CNC is all about computer-controlled machine tools, a lot of that learning has to do with software. 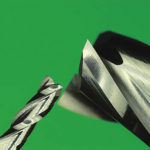 Anyone new to the field will have to get an understanding of the basic software suite that underpins all CNC work. There are a lot of different kinds of CNC Software which I like to call “Digital Tooling.” You don’t need to know about all of it, but if you’re curious we have a Complete Guide to CNC Software that breaks down exactly what it all does. CAD Software: CAD is drawing on the computer, but with measurements applied to the drawings. Use it to create and revise your designs. CAD Software is how “blueprints” for parts are created in the CNC world. CAM Software: CAM takes a CAD drawing file in and with a lot of hints from you, uses the information to create g-code. 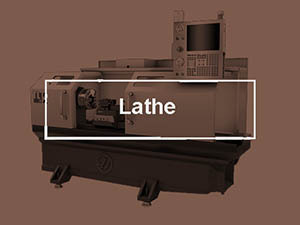 G-Code is what your CNC machine is programmed with. Feeds and Speeds Calculator: While a lot of CAM packages have some notion of Feeds and Speeds, it’s really terrible. Poor Feeds and Speeds was one of the top complaints about CAM Software in our annual surveys. As a beginner, you’ll want all the help you can get to avoid breaking tools, and a Feeds and Speeds Calculator will make that easy for you. Controller Software: This is usually built into your CNC Machine, so we won’t talk about it much here. 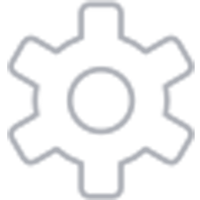 We”ll go over each one and see what you should look for before purchasing the software and what some of the best choices for you to consider are. Before we do that, I want to touch on a couple of more general topics. First, I want to go over whether Free Software is right for you. Second, I want to talk about how Pros and Beginner/Hobbyists approach this software differently, and how that should affect how you’re choosing your software. 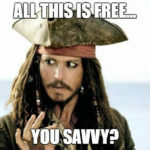 Free Software: Is it Right for You? Is Free Software right for me? The answer is not obvious, despite what your wallet may be telling you. The problem is that free software is seldom the best in anything but price. As I already mentioned, there’s a lot to learn to be making parts successfully and routinely via CNC. Do you really want to have to fight an uphill battle against non-intuitive and often buggy software just to save a couple of bucks? Take my word for it, you don’t. The free software that’s available is vastly inferior to the paid, and there are many paid packages that are not all that expensive anyway. 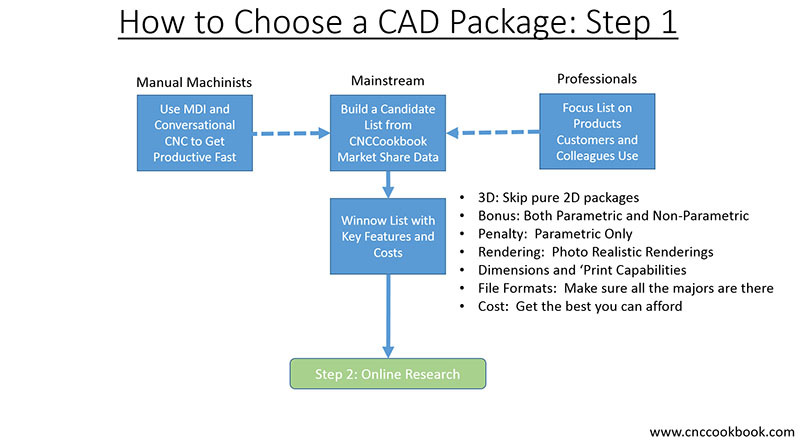 You only need to come up with three packages–CAD, CAM, and Feeds/Speeds Calculator. There are even deals available that bundle a couple of these together. Read on to check them out. They’ll save you loads of time and frustration in exchange for a few dollars. Getting off to a great start in CNC is worth it! In many pursuits, it’s tempting to want to start with the best. Get what the Pro’s use, how can you regret it? The reason why that may not be the best approach is that Pros and Beginners need to solve different problems. Consider: many shops run the market-leading software packages because they need to work with Customers and they need to be able to hire Talent that’s familiar with the software Day 1 without requiring a lot of expensive training to come up to speed. 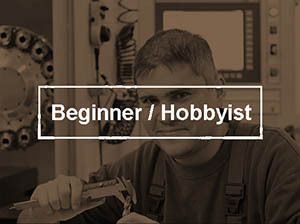 Beginners and Hobbyists shouldn’t care less about either one of those issues. Pros need the software that performs best for someone who is an expert in using the software. They want CAD that lets experts create precision drawings faster. They want CAM software that generates g-code that executes as fast as possible on their CNC machine, even if that means only experts can make the software do anything at all. While faster drawing and faster g-code may sound great, Beginners and Hobbyists often just want to get to making their parts as soon as possible. Who wants to invest hundreds of hours before you can do even something simple? You want software that’s easy to learn and affordable, even if it isn’t the ultimate in powerful. If you can accept that and stick to it, you’ll be up and running your own CNC parts a lot faster. Step one is to find some CAD software you can learn to love. This is the software you’ll be using more than any other of the 3 basic packages, and it will take the most time to master as well. 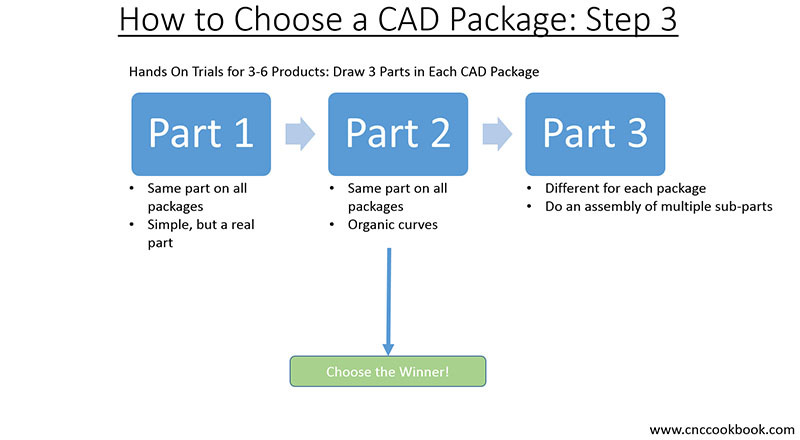 The very first thing you need to know is that there is no one single best CAD package for everyone. There’s not even a best for Beginners. That’s because different individuals will find different packages to be more or less intuitive (i.e. in tune with the way they think about drawing on computers) and therefore easier to learn. You’re going to need to invest 2 weeks or so trying out each package you put on your short list, and I advise you to try to put 3 packages on the list. 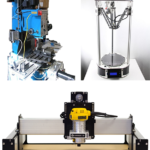 If you’re building a CNC Machine, or waiting for one to arrive, spend that time wisely trying out CAD packages to find the right one for you. I’ll tell you more about how to try them out once you’ve got your short list, but first, here are a few things to think about when putting together your short list of CAD packages to consider. As a Beginner/Hobbyist, you don’t want an obscure package that very few people are using. You want something that many are using so it’ll be around for a long time and so you can find people to help you with it. 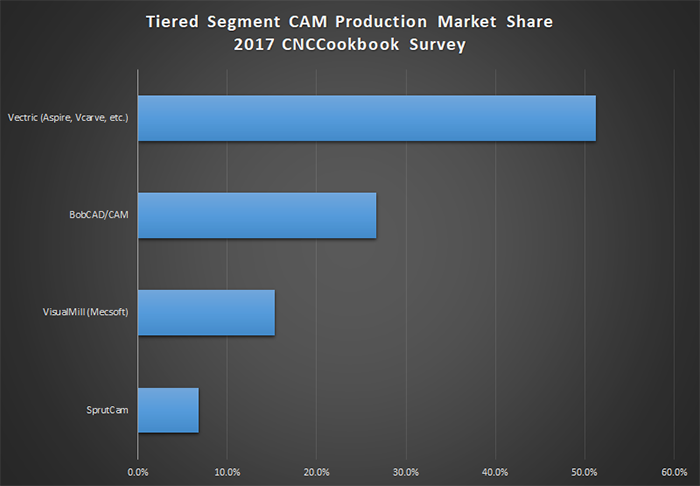 Good news: we have extensively surveyed CNC’ers about CAD and CAM and can tell you what the market shares are. Here’s another tempting possibility. Integration always sounds good, right? And most CAM packages have built-in CAD. So maybe we don’t need to worry about CAD. Maybe we just choose the right CAM and it will take care of the problem with its integrated CAD. There are two things that I want you to take away about prospects for integration. 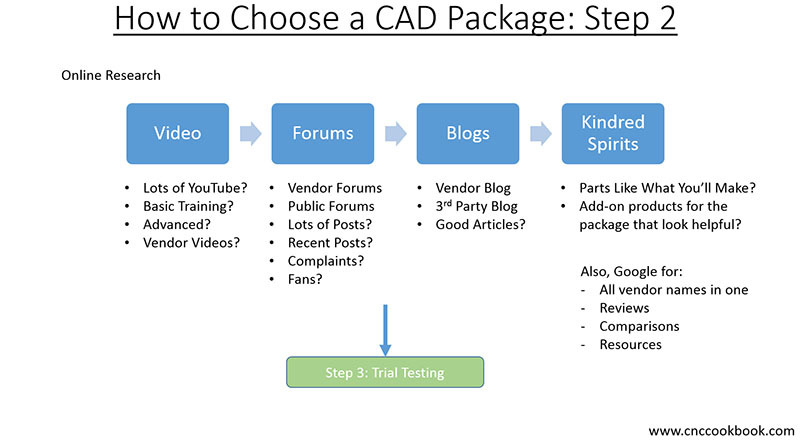 First, it is far more important that you have a great CAD package than that you have an integrated CADCAM package. Most of the all-in-one packages with two exception (Fusion360 and Aspire) are riddled with compromise when we talk about CAM software that has built-in CAD function. For that reason, I highly recommend that if you want integration, you look for CAM that integrates with a successful CAD vendor’s package. It so happens that Fusion 360 is such a package, which is probably why it is the one exception. Second, Integration is far more important to Professionals than Hobbyists and Beginners. Basically, take it if the CAD and CAM you choose are compatible and the right choices on their own, but don’t worry about integration otherwise. I’m a big believer that Community should absolutely be your first consideration when selecting your CAD software. As a Beginner or Hobbyist, you will need help learning the software. You’ll have questions. And, you don’t know what you don’t know. A thriving online community can help with all that. Take your list of potential CAD software, and go looking for great online communities that support that software. I can tell you right now that all things Autodesk, including Fusion 360 have great online communities. Solidworks has a great online community. Rhino3D, which would otherwise be one of my favorites, uses a very old-fashioned (dating back almost pre-PC) approach to online community that’s not very user friendly. I’m not sure I can recommend it for that reason. Any package with hundreds of thousands to over a million available YouTube videos is going to be easy to find free online training for. And BTW, those are the top 6 packages by market share from our survey too. Most Beginners and Hobbyists can’t spend $4000 on a CAD package any more than they can by a brand new state-of-the-art VMC. They need something affordable, and that means hundreds of dollars, not thousands of dollars. 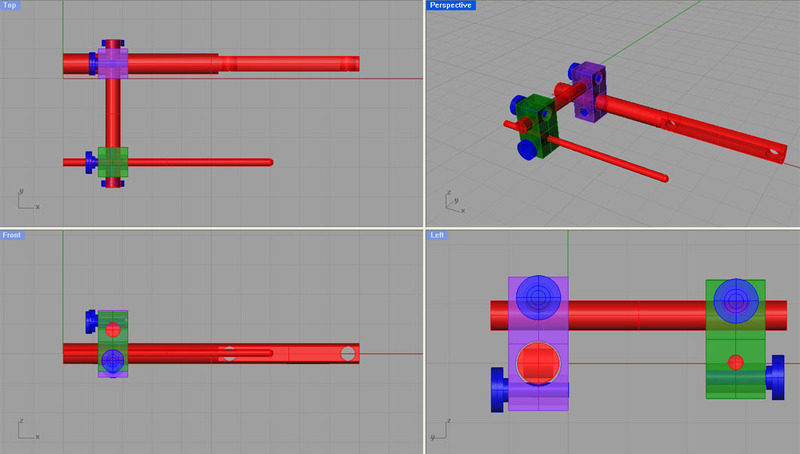 In this day and age, why consider a pure 2D CAD system? All the reputable 3D systems can read and write DXF (the most popular 2D file format) and can create 2D models as well. OK, we’ve gotten this far and we have a few rules of thumb to use in getting to our short list. Now that you’re down to just 2 or 3 choices, it’s time to evaluate those choices. You need to invest some serious time to doing that. I recommend you spend 2 weeks on each package. That’s because it’ll take that long to get past the initial frustration and learning curve so you can begin to discover whether the package suits you or not. That one comes from my article “Secrets of Going From CAD, Image, DXF, or STL to GCode for CNC and 3D Printing“. 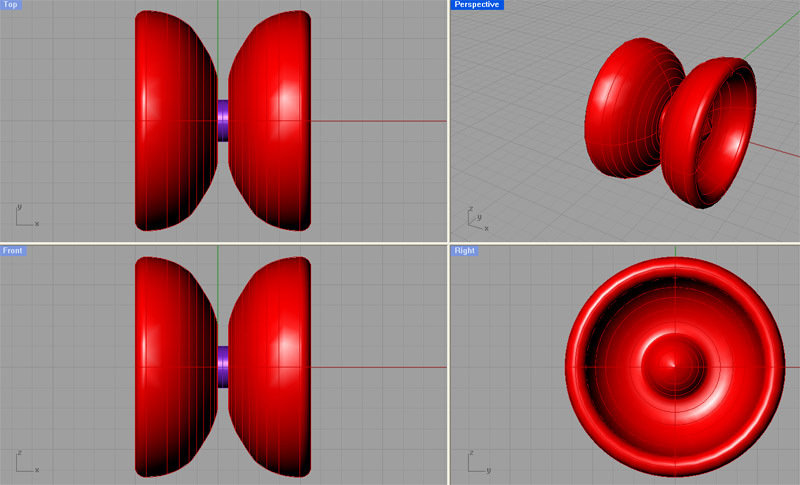 YoYo’s can be awesome CNC projects! If you can draw all of those in each CAD package you’re evaluating (or similar things you want to draw), you’ve done your homework. In all likelihood, one of the packages will stand out from the others. Your choice will probably not be the same as your buddy’s choice or the choice of the gang in the online Machinist’s Board talking about CAD. That’s fine. We all have different styles. The important thing is to choose the software that’s best for you! Having gotten your CAD software chosen and more or less under control, the next step is CAM software. 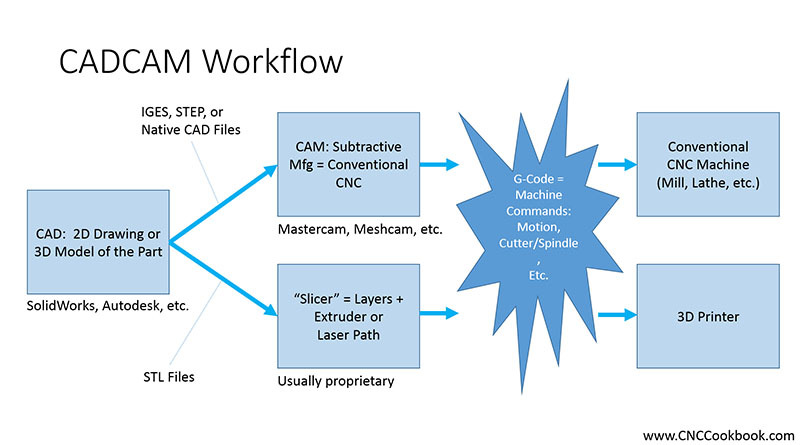 Recall that the role of CAM is to take in the CAD model and generate g-code from it that your CNC machine can run. Every beginner hears that bit about the role of CAM software and they get the wrong impression about 90% of CAM programs. They think they’re just going to load the CAD into the CAM package, push a button, and out comes their g-code ready to go. What a disappointing it is to learn that things are a LOT harder than that! At least in most cases, I will mention an exception shortly. If you’re willing to choose the right simplified CAM software instead of insisting on the all-time most powerful CAM, you can greatly reduce your learning curve. If you’re willing to accept a less powerful CAM program for a little while, you can get started making parts almost immediately. And, you’ll come as close to the ideal of “Push a button and automatically convert a CAD model to G-Code” as is possible. The less powerful CAM program you want in this case is MeshCAM. When I discovered how easy it is to get results with MeshCAM, I went straight to the developers and begged them to let me be a MeshCAM dealer. I wanted to be able to share this incredible find with others, especially beginners. Personally, I really think every beginner should start with MeshCAM and graduate to something more powerful when you’re ready. It will get you making real parts faster than anything else out there. But what do you give up? MeshCAM’s G-Code programs are not the optimal production-speed programs other CAM can produce. BTW, they’re not horrendously slow either, their just not going to be in the top 10-20% of the speed demons. For many hobby machinists, this doesn’t matter at all. If you’re trying to run a CNC Business, you won’t be able to afford the inefficiency for very long. 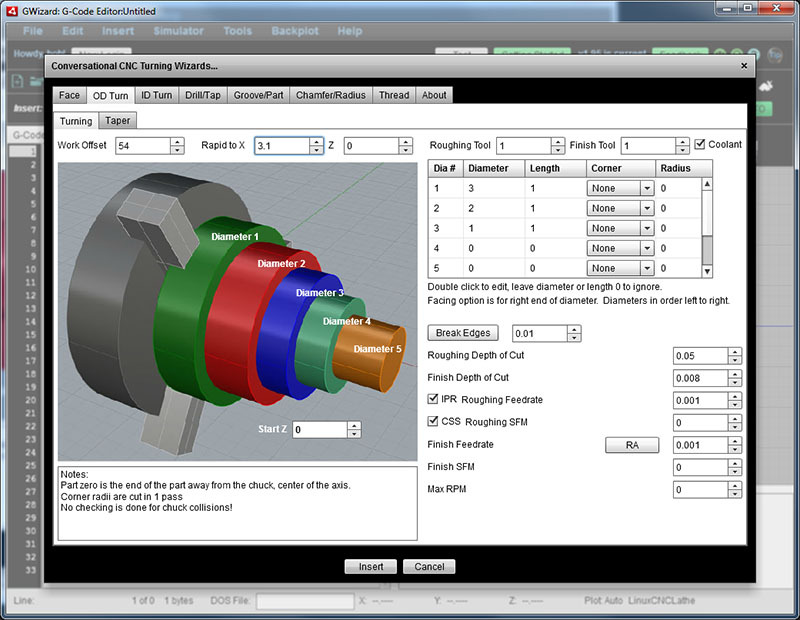 MeshCAM’s G-Code programs may be longer than other CAM software. This is part of the whole efficiency thing, but looked at in a slightly different way. Unless your CNC Machine is old and has very little memory, this just isn’t going to matter to you at all. You may give up some precision. A lot of beginners get wrapped up in precision too early. Give a competitive person a number they can measure and suddenly they have to beat it. For most CNC Work, MeshCAM will be fine. If you need to have accuracy to the last thousandth, let alone the last ten thousandth of an inch, MeshCAM doesn’t give you enough control to accomplish that easily. For most beginners and hobbyists, this won’t matter at all. 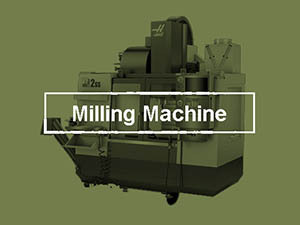 You don’t need to understand when and how to use a zillion different toolpath types. 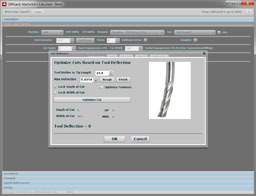 Our Toolpath overview page literally has 22 different types listed, and the better CAM packages can do them all. The trouble is, that’s a lot to learn just to understand when to use each one let alone how to set each one up. MeshCAM limits that to just a few and helps you determine which ones to use. Telling the CAM where on the CAD drawing to put the toolpath. This is a complex and often frustrating process for beginners to master. Establishing coordinate systems, origins, and designating different features to your CAM software is a hassle. Yes, it gives you ultimate control over what happens, but there’s no middle ground for beginners. With MeshCAM, it takes the CAD drawing as a hole and figures out how to deal with it. You answer a bare minimum of questions to get it going. Tool Libraries, Style Sheets, and more. Fancy CAM has fancy power user features. In many cases, they make you use them whether or not you need them. MeshCAM has thrown away most of this in the interests of simplicity. That means you get g-code for simple jobs done a LOT faster. MeshCAM has a free trial, so I seriously recommend you give it a try before you even look at the competition. Yeah, I get it. All the guys over on the Machinist’s Board have gotten you all wound up about how awesome the Acme Terminator Super Whiz Bang CAM software is. They learned it, they say it was easy, so why can’t you learn it too? Market Share & Lots of YouTube Videos: I’ll give you the list below. Watch a ton of those videos and see which ones are easier to follow. That may be because that CAM package is easier to follow! Affordability: You don’t need a $10,000 CAM package. You don’t even need a $1000 package in all likelihood. Plan to try 2 or 3 packages. Spend up to 2 weeks on each. Okay, let’s have a look at market share. 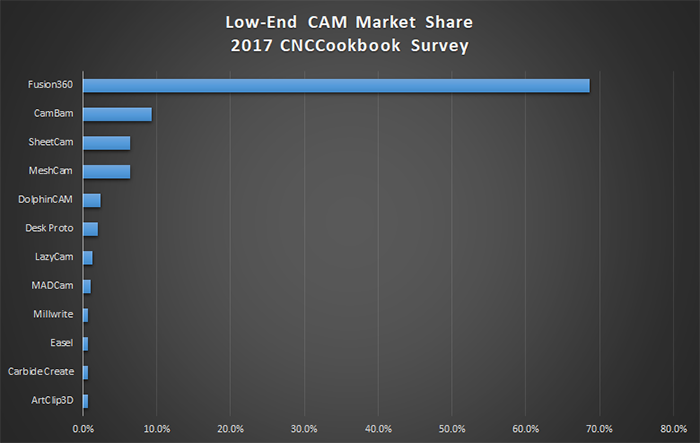 These charts are from our 2017 CAM Survey. 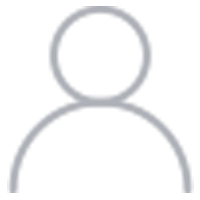 MeshCAM: Just because it really is the easiest by a wide margin. CamBam: Cheap and cheerful. This is what you get if you take conventional CAM, greatly simplify it, and leave out a lot of Power User Features. Think of it as a Mustang among Corvettes and Porsches. Not the ultimate but a pretty sweet ride. My only issue with it is I wonder whether it sits too close to MeshCAM without the simplicity and too far from the other two without the power. I kinda think it is, but that doesn’t mean you shouldn’t spend time with it and make up your own mind. Vectric/Aspire: This software is hugely popular with the CNC Router crowd because it does so many cool things for making fancy signs and artistic designs. 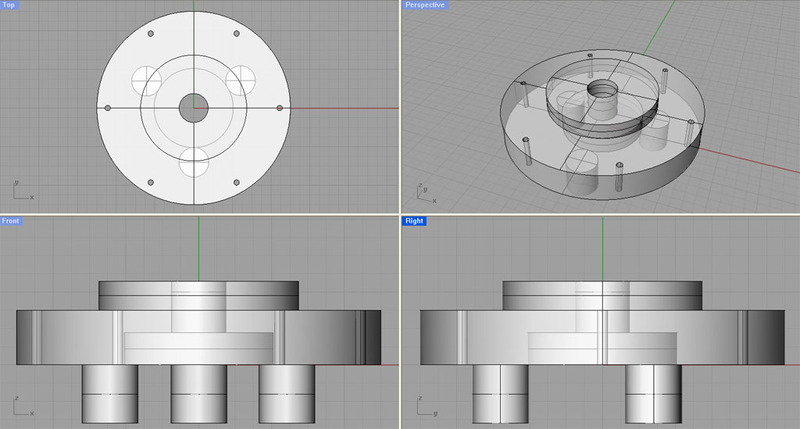 I like it a whole lot, and if I wanted to do a bunch of artsy stuff, I would choose it over Fusion 360 for sure. Fusion 360: This is the current fave at the low end. If nothing else it marries a pretty high-powered CAM Package (HSM Works) with pretty good CAD at an incredibly low price. What’s not to like? Well, let me be honest. I use Fusion 360 more than any other CAM, but I hate how buggy it is and I think it’s User Interface is the worst of any of the packages I talk about here. It’s a fairly nasty uphill slog to become proficient, and if you don’t use it constantly, you will backslide and have to relearn things that should be obvious. But, once you are proficient, you will rock with it. Except when the bugs are biting. In fairness to MeshCam, it’s so simple I can’t imagine what you would make over 2500 videos about. But you can clearly see that Fusion 360 and Vectric Aspire have a ton of videos available for you to learn from. Personally, I recommend you evaluate all four packages. Get the free trials. But get them one at a time. And be sure to do the MeshCAM trial first. That way you’ll see how easy it can be. With that in mind, what you’re evaluating with the others is whether you think you can get proficient fast enough to be satisfied skipping MeshCAM and going to something else that’s more powerful. If you can, great! But if you can’t, no worries. MeshCAM has your back until you have enough experience to want to try something else again. You’ve got CAD and CAM covered, you are ready to make parts, right? Hang on there! Friends don’t let friends make parts with CAM software feeds and speeds. Simply put, CAM software does a lousy job of it, something our survey respondents have told us year after year. 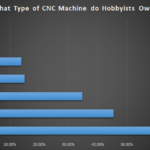 Plus, when we surveyed folks and asked them what was hard to learn about CNC, guess what they said? Feeds and Speeds are by far the hardest thing to learn. Much harder than CAD or CAM. That’s why you need a good Feeds and Speeds Calculator. And boy have I got one for you. I won’t lie–our G-Wizard Feeds and Speeds Calculator is AWESOME for professional CNC’ers. That’s why thousands of the world’s best manufacturers use it. 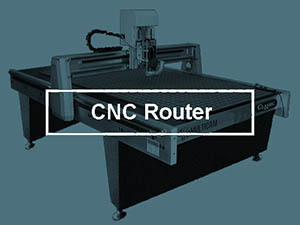 It is set up to deal with the limitations of lightweight CNC machines. It will adjust your Feeds and Speeds to what your machine can handle. It gives you lots of written Tips that professionals take for granted but beginners don’t get to learn unless they’re lucky enough to be mentored by professional CNC’ers. It has a powerful “Cheat Sheet” that lets you tailor your cuts as you wish. Do you want to go faster? Slower? Get better finish? Longer tool life? The Cheat Sheet is built in and will tailor Feeds and Speeds for your goals. Getting Started Tours and Glossary. We offer the best training in the business with guided tours, worked examples, and even a built-in glossary of terminology. This is all stuff many had to dig out bit by bit that G-Wizard gives you in easy to consume tidbits. You’ve got pretty much the whole story of how a Beginner can get their CNC Software act together on the cheap and have the best solution for their needs. Just one or two more things I need to cover. If you’re an accomplished Manual Machinist, this section is for you. If not, go ahead and skip it. Manual Machinists can make parts without needing CAD or CAM software. You know that if you’re a Manual Machinist. But here’s the thing–you can do the same only even better on a CNC Machine! That’s right, you can leverage your skills to be making parts right away. 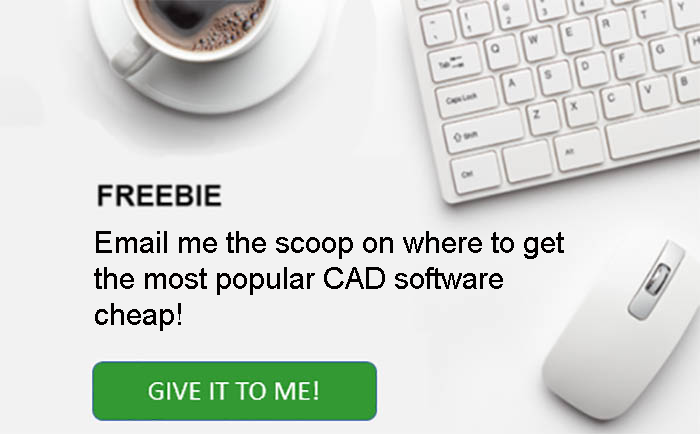 Yes, you will want to learn CADCAM too, but for now, you can be at least as productive as you are on a manual machine with a minimal learning curve. The first thing to realize is you can run your CNC a lot like a manual machine using something called “MDI”. It stands for “Manual Data Input.” Basically, you type in a simple command and the machine executes it immediately. Those commands are g-code, but all you need is a simple subset consisting of just 10 g-codes. We give you everything you need to master it in our G-Code Course. Go ahead and check it out. You can be making chips on a CNC in a matter of hours. A Manual Machinist who understand MDI can basically treat a CNC Machine as a manual machine that has DRO’s and Power Feed on every axis. You’ll quickly see it’s even better though. For example, the “DRO’s” are tied into the power feeds and you can set them to stop feeding at a precise coordinate. Also, you can move in any direction, not just X or Y. So you can cut diagonals. Plus, circles and arcs are easy–no need to set up a Rotab. It’s pretty sweet once you understand how easy it is to make chips this way. You can create a g-code program to cut a bunch of OD’s on a part really fast with Conversational Programming. Learn more about it here. Hey you stuck with us through a very thorough but long article–I appreciate it! I know this stuff is important, that’s why I work so hard to put these articles together. But I’d like to reward you with a Smokin’ Deal. How about a copy of MeshCAM and a 1 year license for our G-Wizard Feeds and Speeds Calculator? If you buy MeshCAM from the developers, it’s normally $250. And, if you buy the 1 year G-Wizard Calculator from us, it’s normally $79. Together, they’d wind up costing you a total of $329. I can let you have them both together for $259 so you save $70. Put another way, I am giving you GW Calculator for just $9 instead of $79. Whoa! You don’t see those kinds of deals every day, but this one will get you started making parts fast. BTW, if you’re worried about GW Calculator only being 1 year, don’t. At the end of the year, when it expires, every single features keeps working. The only thing that changes is there will be a spindle power limit of 1 horsepower. That’s all many hobbyists need, and they’ve got that for life. If you want more, it’s super easy to renew too.